If you have been meaning to check on availability in your favorite May retreat, check now! May retreats are filling fast, but there’s still a few spots left for: Wild Heart Writing Retreat, Daoist Walking QiGong and Aligning With Stillness Yoga Retreat. Call us to find out if there’s room for you. 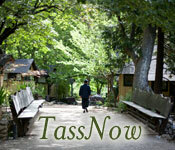 � NOTE: TassNow room availability updates refer only to last-minute / near-future availability at Tassajara. These updates don�t necessarily mean that other dates aren�t available. For all inquiries about availability and reservations at Tassajara, please contact Tassajara, as indicated above.